Philadelphia, where the U.S. Constitution was drafted in 1787, served as the nation’s capital for one decade in the 1790s. It was a decade of nation-building in many ways, from the drama of politics to the creation of a national culture. The U.S. Congress, meeting in the County Court House (Congress Hall), passed the Naturalization Acts, a Fugitive Slave Act, and the Alien and Sedition Acts. With so many of the young nation’s prominent citizens present, Philadelphia became a magnet for artists who arrived to paint portraits of politicians and other notables. The city also became a capital of African American community-building with the rise of leaders such as Absalom Jones, Richard Allen, and James Forten. The first U.S. Census found the city of Philadelphia and its adjacent suburbs of Southwark and the Northern Liberties to be the most populous urban center in the new nation. Philadelphia’s fortunes — and misfortunes — extended beyond its boundaries. The city’s commercial ties extended to interior Pennsylvania with the construction of the Lancaster Turnpike in 1793-95. And when yellow fever hit in 1793, Philadelphians with the means to do so fled to the countryside of Grays Ferry, Germantown, and South Jersey. Library of Congress (Explore in Independence Hall and Philadelphia and Its People in Maps: The 1790s). Library of Congress (Explore in French Revolution and Girard College). PhillyHistory.org (Explore in City Hall (Philadelphia) ). Library Company of Philadelphia (Explore in Banking and Political Parties (Origins, 1790s) ). Library of Congress (Explore in Political Parties (Origins, 1790s) ). December 6, 1790: Philadelphia becomes capital of the United States; also continues as capital of Pennsylvania. 1790: Political parties sponsor competing newspapers, Federalists the Gazette of the United States, and the Jeffersonians the National Gazette. 1790: First U.S. Census finds that Philadelphia, together with its adjacent suburbs of Southwark and Northern Liberties, is the nation’s largest urban area, with 44,096 residents. 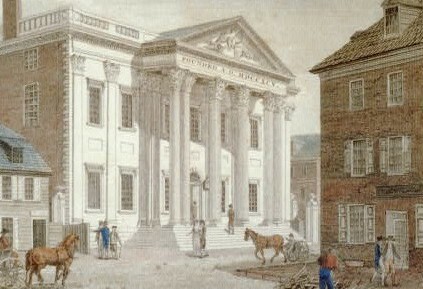 1791: The First Bank of the United States is granted a twenty-year charter in Philadelphia. In addition to holding government funds, the bank (pictured here) could collect taxes and make short-term loans to the government. 1792: African American worshippers walk out of St. George’s Methodist Church rather than submit to segregated seating in newly constructed gallery. 1792: The first United States Mint is established in Philadelphia. Coins are made of gold, silver and copper, in denominations of $10, $5,$2.50, quarter dollar, dime, nickel, half dime and half cent pieces. 1792: New Jersey Manumission Society is formed. 1792-97: In an attempt to keep the capital, Philadelphians build a President’s Mansion (shown here) at Ninth and Chestnut Streets; Presidents Washington and Adams choose instead to rent a different mansion at Sixth and Market. 1793: New Jersey Society for Promoting the Abolition of Slavery is formed. Chapters are started in Burlington, Salem, Cumberland, Essex, and Gloucester Counties. February 2, 1793: Congress passes Fugitive Slave Act. February 6, 1793: Société Française de Bienfaisance de Philadelphie formed to aid refugees from revolution in France and West Indies. March 1793: Second inauguration of George Washington as U.S. President. May 1793: Rally in State House yard welcomes French minister Edmond Genêt, representative of French revolutionary government. June 1793: Hundreds of refugees arrive in Philadelphia from St. Domingue (Haiti) to escape the slave rebellion led by Toussaint L’Ouverture. July-November 1793: First of seven yellow fever epidemics kills approximately 10 percent of Philadelphia’s population. 1794: First Spanish-language book in the United States is published in Philadelphia: El Desengaño del Hombre, by Santiago Puglia, an exile from Spanish America. 1794: Charles Willson Peale’s Museum, founded in 1784, moves to Philosophical Hall in the State House Yard. 1794: William Birch arrives in Philadelphia, creates engravings of city scenes (example here and in previous three slides) published in 1800. 1794: Philadelphia Democratic Society opposes U.S. excise tax on whiskey. President Washington dispatches militia to suppress violent rebellion by farmers in Western Pennsylvania. 1794: Chestnut Street Theater opens. 1794: The Columbianum, first society for promotion of fine arts in U.S., established. July 1794: Bethel Church dedicates its first building at Sixth and Lombard Streets; African Episcopal Church of St. Thomas opens on Fifth Street. 1795: The sixty-two mile Philadelphia and Lancaster Turnpike opens. It is considered the first engineered road in the country. June 25, 1795: U.S. Senate ratifies controversial Jay’s Treaty with Great Britain; Philadelphians protest in the State House yard and a mob attacks the home of Anglophiles William and Anne Willing Bingham. 1796: Convention of the nation’s abolition societies meets in Philadelphia City Hall (Old City Hall). May 21, 1796: Oney Judge, one of Martha Washington’s slaves, escapes from the President’s House (depicted here), eventually settling in New Hampshire. March 4, 1797: Inauguration of President John Adams; first peaceful transfer of power. April 25, 1798: “Hail, Columbia,” by Joseph Hopkinson, introduced at Chestnut Street Theater. June-July 1798: Congress passes Alien and Sedition Acts. 1799: The Lazaretto, the first quarantine hospital in the United States, opens on the Delaware River south of Philadelphia and remains the main immigration station for the city until 1893. 1799: With the state’s population spreading westward, Pennsylvania state capital moves from Philadelphia to Lancaster. May 14, 1800: Philadelphia (shown here in 1796 map) ceases to be the Capital of the United States; federal government moves to the new District of Columbia. Bowling, Kenneth R. and Donald R. Kennon, eds. Neither Separate Nor Equal: Congress in the 1790s. Athens, Ohio: Ohio University Press, 2000. Brigham, David R. Public Culture in the Early Republic: Peale’s Museum and Its Audience. Washington: Smithsonian University Press, 1995. Hutchins, Catherine E. Shaping a National Culture: The Philadelphia Experience, 1750-1800. Winterthur: Henry F. DuPont Winterthur Library and Museum, 1994. Meranze, Michael. Laboratories of Virtue: Punishment, Revolution, and Authority in Philadelphia, 1760-1835. Chapel Hill: University of North Carolina Press, 1996. Powell, J.M. Bring Out Your Dead: The Great Plague of Yellow Fever in Philadelphia in 1793. Philadelphia: University of Pennsylvania Press, 1949. Rilling, Donna J. Making Houses, Crafting Capitalism: Builders in Philadelphia, 1790-1850. Philadelphia: University of Pennsylvania Press, 2001. Sellers, Charles Coleman. Mr. Peale’s Museum: Charles Willson Peale and the First Popular Museum of Natural Science and Art. New York: W.W. Norton & Co., 1980. Smith, Billy G. Life in Early Philadelphia: Documents from the Revolutionary and Early National Periods. University Park, Pa.: Penn State University Press, 1995. —–. The “Lower Sort”: Philadelphia’s Laboring People, 1750-1800. Ithaca, N.Y.: Cornell University Press, 1990. Wright, Robert E. The First Wall Street: Chestnut Street, Philadelphia, & the Birth of American Finance. Chicago: University of Chicago Press, 2005.